One person is dead and a suspect is in custody after authorities say a woman pushed another person onto the subway tracks in Times Square Monday afternoon. The female victim was pronounced dead at the scene. The woman suspected of doing the pushing was taken into custody after several people who witnessed the incident flagged down officers. A woman was shoved to her death in front of a moving train at Times Square station Monday afternoon, authorities said. The 49-year-old victim was standing on the platform waiting for the 1 train when a 30-year-old woman wearing a pink shirt and scarf shoved her onto the tracks around 1:20 p.m., authorities said. She was struck by an oncoming train and died at the scene, police said. The suspect, who has a history of bipolar disorder and schizophrenia, was taken into custody, according to police. The women were seen arguing on the train platform before the deadly push, cops said. The suspect looked “proud” after she shoved the victim onto the tracks, according to an MTA worker. “About 5 minutes ago 20 police officers escorted her out…Her head was up — kinda proud of what she did,” the MTA worker said. Police were reviewing surveillance footage of the fatal push, Manhattan Chief of Detectives William Aubry said at a press conference. A woman died after being shoved in front of an oncoming subway in the heart of Times Square Monday, and a woman arrested in the deadly shove may be linked to another subway death, police sources familiar with the investigation tell NBC 4 New York. Police and firefighters swarmed the Times Square station at 42nd Street shortly after 1 p.m. after getting a report of a person pushed in front of a train. The 49-year-old victim was pronounced dead at the scene. The suspect, 30-year-old Melanie Liverpool of Queens, was taken into custody at the scene and later charged with second-degree murder, police said. It wasn't clear if the suspect and the victim knew each other, nor was it known if they had some type of dispute prior to the alleged shove. Law enforcement officials say Liverpool previously claimed to police she had shoved another person in front of an oncoming train at Union Square station on Oct. 19. At the time, police did not find her claim credible; two different witnesses told investigators the victim had jumped in front of the train and treated the death as a suicide, officials said. A schizophrenic who last month lied to cops about shoving a woman to her death at a subway station actually did it on Monday — killing a female straphanger on a Times Square platform, police sources said. Melanie Liverpool-Turner, 30, pushed Connie Watton, 49, onto the tracks as they stood on the downtown No. 1 train platform around 1:20 p.m., a law enforcement source said. Watton, of Astoria, Queens, was struck by a train and died at the scene. Liverpool-Turner, 30, of Jamaica, Queens, was taken into custody, according to police. The women may have been riding the same train before the incident but didn’t know each other, police sources said, and it was unclear why Watton was targeted. In a bizarre twist, Liverpool-Turner lied to police last month about pushing a different woman in front of a train at the Union Square station, police sources said. She falsely claimed on Oct. 19 she was responsible for the death of a German college student who was struck by a train, police sources said. But cops soon learned that Liverpool-Turner — who police sources said has a history of bipolar disorder and schizophrenia — made up the story. The 19-year-old student had been struggling with depression over a recent breakup and had actually committed suicide, police said. Liverpool-Turner was sent to Bellevue Hospital for a psychiatric exam after those claims. “Maybe that’s what inspired her to do what she did today,” a police source said Monday. She actually looked “proud” after she shoved the victim onto the tracks, according to an MTA worker. “About five minutes ago, 20 police officers escorted her out . . . Her head was up — kinda proud of what she did,” the MTA worker said. Liverpool-Turner allegedly confessed to the slaying, but had not been charged as of Monday night. MTA officials diverted 1, 2 and 3 trains at the city’s busiest transit hub as Watton’s body was pulled out from under the train. Police were reviewing surveillance footage of the incident, Manhattan Chief of Detectives William Aubry said at a press conference. “Our hearts go out to the victim and the other people who were on the platform and saw this,” Aubry said. “We are looking at video of this incident and the person of interest as they entered the station. “We have numerous witnesses . . . People on the platform did exactly what we wanted [them] to. They saw something and said something,” he said. Olief Wilson, Liverpool-Turner’s 48-year-old boyfriend, said she was headed out to shop in Brooklyn before the attack. “That’s my baby. I’m at a loss for words,” the tearful man said. The woman fatally pushed to her death at the Times Square subway station was a married chef who “loved” working in the Big Apple, her brother-in-law said Tuesday. “Obviously, this is terrible,” the relative said about the senseless attack on Connie Watton, 49, allegedly at the hands of schizophrenic Melanie Liverpool, 30. “Out of a million people, this had to happen to her? She was honestly the most caring, loving, honest person I ever met. She would never hurt anybody. She never feared the city,” said the brother-in-law, who declined to give his name. The relative said Watton’s loser husband was completely distraught. “He’s not doing very well. He’s in total shock,” the relative said. “I hope she gets prosecuted to the fullest extent of the law,” referring to Liverpool. The Post obtained an exclusive first photo of a smiling Watton standing with her husband, who has his arm draped around her. Liverpool, who has a history of mental illness, shoved Walton in front of an oncoming downtown No. 1 train on Monday for no apparent reason, law enforcement sources said. 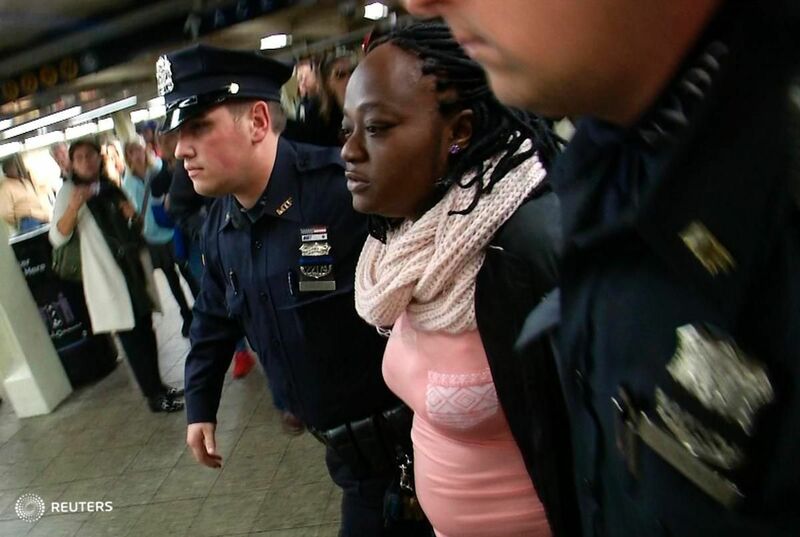 While being handcuffed, Liverpool admitted that she had “pushed someone onto the tracks,” one source said. Previously, she claimed that she pushed a German college student onto the tracks in an Oct. 19 incident at Union Square station. But cops said that the 19-year-old student was upset over a recent breakup with her boyfriend, and took her own life. The woman who allegedly shoved a female straphanger to her death at a subway station appeared Tuesday in court, where she claimed she had not admitted to the crime while being arrested. “What? I did not admit to nothing,” said Melanie Liverpool-Turner, 30, who is charged with second-degree murder. Ah di-int dooz nuffin! Liverpool, who has a history of mental illness, shoved Watton in front of an oncoming downtown No. 1 train Monday for no apparent reason, law enforcement sources said. After striding nonchalantly into Manhattan Criminal Court, Liverpool reacted to Assistant District Attorney Matthew Thiman saying she had admitted to shoving Connie Watton, 49, at the Times Square station. “It’s a strong case with multiple eyewitnesses,” the prosecutor said. But her attorney, Mathew Mari, informed him that Liverpool said she was not guilty. Mari said Liverpool worked as a home aide up until three weeks ago, has no prior convictions and has lived at the same address for three years. He said he met with her for about 15 minutes but got very little out of her. “I know she told me that she did have some kind of medical history but she wouldn’t get into it,” he said when asked about her psychological history. Liverpool, who rolled her eyes a few times during her appearance , was held without bail and is due in court again on Thursday. The widower of a woman who was fatally shoved in front of a subway train over two years ago blasted his wife’s admitted killer calling her a “psychopath” and a “demented piece of garbage” in court Friday before she was sentenced to 20 years to life in prison. Robert Watton made the statements at the sentencing of Melanie Liverpool, who pleaded guilty last month to shoving his gook wife, Connie Watton, in front of a southbound No. 1 train at the Times Square station on Nov. 7, 2016. “I am haunted when imagining what happened to Connie that day by this demented piece of garbage, this murderer,” Watton spat while glaring at Liverpool in Manhattan Supreme Court. “The name Melanie means darkness. You are heartless and you have no soul…She is a danger to the public and I wish nothing but a life behind bars for this psychopath,” an impassioned Watton yelled. Watton said his wife, 49 — a longtime housekeeper for billionaire Blackstone Group CEO Stephen Schwarzman’s family — emigrated from the Philippines as a teen to make a better life for herself and to support her family back home. “She is the love of my life for all eternity,” he said. Justice Michael Obus handed down the harshest sentence he could under the terms of her plea deal. Liverpool’s lawyer, (((Aaron Wallenstein))), argued for 15 years to life behind bars for his client noting that she was sexually abused when she was a child and suffered from mental illness. “She pushed her in front of a train and ended her life and that can only be done by someone who didn’t know what they were doing,” Wallenstein said. “There is no disputing that the loss of life Mrs. Connie Watton is nothing short of a tragedy,” Wallenstein added. Last year, Robert sued the city’s Health and Hospitals Corp., which runs Bellevue Hospital, for releasing Liverpool despite the fact she had raved in the hospital about killing transit riders.